Rochelle Ford is confident she can lose that last 25 pounds with the help of Pound for Pound, an 8-week weight loss program that starts Monday, Jan. 16. 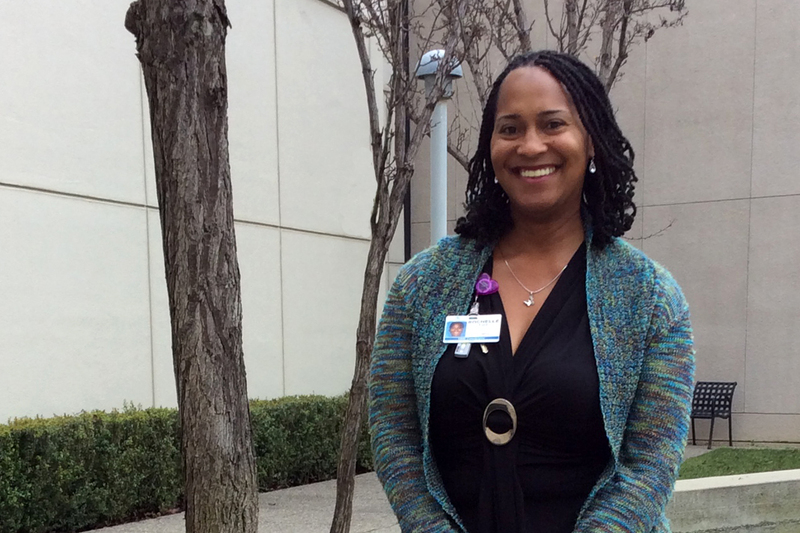 People are doing a double take when they see Rochelle Ford at work in the hallways of the Vallejo Medical Center. Ford has lost almost 75 pounds since last May — and is confident she will reach her weight loss goal of 100 pounds. So how did she do it? Ford credits a supportive family, an active team at work, and small steps. She had been “wanting and wishing” to lose weight for years. Now she wonders why she struggled for so long. With 25 pounds to go, she is excited for the new Go KP Pound for Pound Challenge to provide additional support to help her reach her goal this year. The Pound for Pound Challenge offers KP employees online weight loss support with tips, tracking, and resources, and encourages peer-to-peer support. This year’s challenge begins on Monday, Jan. 16. Kaiser Permanente will donate a pound of fresh produce to the national food bank network Feeding America for each pound lost, or 5 pounds of produce for weight maintained during the challenge. Last year, more than 57,000 pounds of produce were donated to families in need. In September 2012, Ford was hit by a car. After the accident, she couldn’t walk and future mobility was uncertain. The senior staff assistant in the Rehabilitation Department was stuck at home, in pain, and feeling discouraged about her weight. “I told myself, ‘You had opportunities to walk and run and you didn’t take advantage of it or the weight loss resources and programs at work. Enough is enough,’” Ford said. Determined to tackle the problem head-on, she vowed to make some changes when she recovered. When Ford took a new job as a podiatry residency program coordinator in the Quality Department in March 2016, she quickly noticed her team’s level of activity. Ford started with short walks and “little bits” of exercise ― such as walking to a restroom on a different floor ― to add in more steps. Now she joins the team on outside activities, including quarterly 5K runs. And she is a big fan of an early morning workout to get her clear-headed and ready for another busy day at work. More activity led to better eating habits. First cutting out unneeded carbs, Ford found ways to make healthier food choices. She acknowledges each 5-pound milestone along the way with a little celebration. It might be a pedicure, a new workout outfit, or trying a new recipe.